When we developed our very first website many years ago, we created the Ask the Gardener' forum. It provided our viewers the ability to send in their gardening questions which we research and reply. We've saved all those wonderful questions and answers and created a sizeable knowledge base for all of you. And of course, you can still submit your questions to our experts. We've been putting together a list of our favorite plants, shrubs and trees. It's far from being an all encompasing plant list, but it highlights plantings we're used very successfully in our gardens over the years. The list can be sorted by plant type, perenials, shrubs and trees. Or you can just scroll on through it to see if anything jumps out at you. Eventhough individual landscapes have unique personalities and needs, there are general things that can be done every month for every garden. 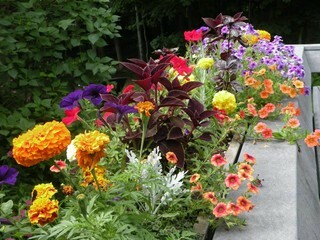 Our owner Geri developed this monthly tips to help her clients gets the most of their gardens. If you are on a scheduled maintenance plan with Churchill Gardens, we will perform all this for you. Please note, these tips reflect needs for western MA, planting zones 4 & 5. Approximately every month during the growing seasons, Geri pulls together wonderful planting and gardening articles, tips and stories to share with her newsletter subscribers. Interested? Please use the links below to see her current or past newsletters as well as subscribe to have it sent straight to your inbox.